This post may not make much sense intially to those who are new to kombucha – if that’s you, perhaps head over here to check out an earlier post, otherwise I’m sure I’ll sound just a wee bit batty, Lx. I have a confession. I killed my kombucha culture. After a good year or so of conscientiously doting on my pet scoby, cleaning and sterilising, boiling and dissolving the sugar and tea mixture, dotingly checking in to taste test as it fermented away over the week, and peeling off the new ‘mushrooms’ to spread the love and give to friends, I began to almost resent the little guy. So. Much. Work. (Me, sipping store bought kombucha) Well this is a nice treat, a few dollars well spent, and no handling of that slimy little mushroom thing. Ok, right, I’ve had enough, you’re done! Out with you! And so you see, it’s not easy being healthy sometimes, even with the best of intentions. I still feel a pang of guilt when I think about my old friend, but then again, I don’t miss the odd jars on the counter top, filled with alien looking substrates, the subtle scent of vinegar wafting through the air. Call me fickle, but I have a new love. I’ve been making batch after batch of coconut water kefir lately, to fill in the gap left by my stalled kombucha production line. They are both lovely, probiotic rich tonics, beneficial in helping establish a healthful gut microflora, ultimately letting you enjoy greater immunity and overall health. However, the kefir, in my opinion, is far easier to look after (it’s the handling of that big thick scoby that really gets me) and actually yields a pretty damn tasty drink. So let me tell you a bit about kefir, and share the simple recipe I’ve been following. It’s truly a far less complicated way to get your daily boost of probiotics. Kefir, like kombucha, is a fermented drink filled with probiotics, lightly fizzy and quite delicious. Probiotics, meaning, ‘for life’, are non-pathogenic, beneficial bacteria that help to maintain the balance of the gut microflora. They can help prevent the overgrowth of harmful bacteria, and maintain the integrity of the intestinal mucosal barrier – helping prevent conditions such as leaky gut and inflammatory bowel disease. Beneficial bacteria species can also modulate the immune system and down regulate inflammatory cytokines, prevent diarrhea, improve lactose digestion, help manage allergies, lower the risk of colorectal cancer, protect against respiratory tract infections, relieve constipation and prevent urinary tract infections in us ladies (1). Fermented products are all sources of probiotics – kombucha, beer, bread, wine, cheese, tempeh, miso, kimchi, yoghurt, sauerkraut. 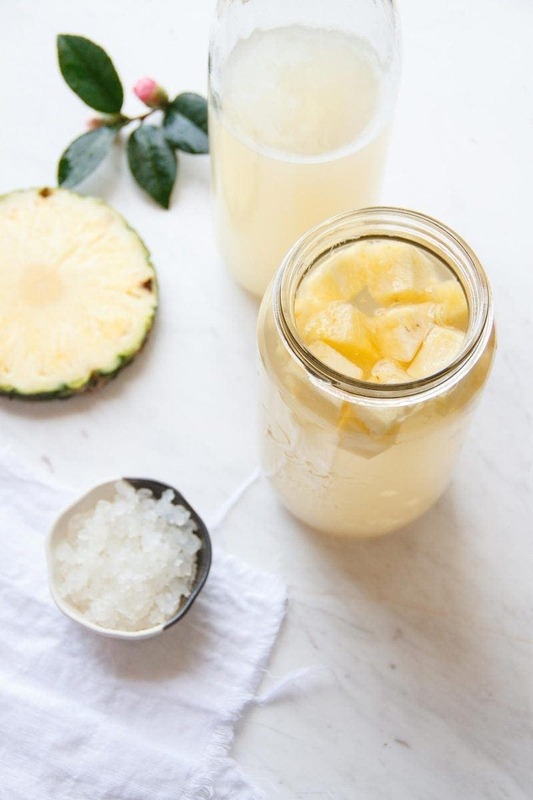 The recipe I am sharing today is using water kefir, not dairy. There is a difference. But first I’ll tell you a little about the origins because it is quite a fascinating story. According to legend, some 10,000 years ago, nomads and wanderers in the Middle East and Middle Asia would travel long distances, carrying pouches fashioned out of animal skin filled with milk, for nourishment. The low humidity and high temperatures caused the milk to ferment, and, upon drinking it, they were quick to realise the nutritive value. And so, despite not really knowing how or why it worked – kefir as a functional food was born. Well, I’ll admit, it is still a bit of a mystery really.The grains themselves are still cultures of yeasts and lactic-acid bacteria, though I’m uncertain of their origin. 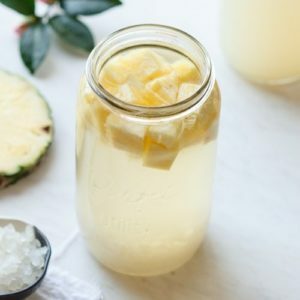 Water kefir refers to a dairy free fermented beverage made using sugar water, coconut water or fruit juice rather than milk. 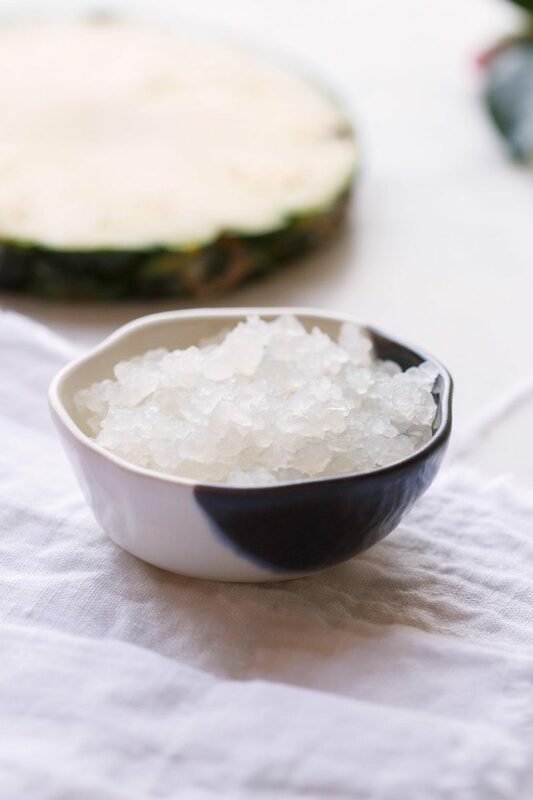 Sugar is needed when using water (coconut and fruit contain natural sugars of course) as the grains need something to feed off – whereas in making dairy kefir, they thrive off the natural sugars already present in the milk. You can buy kefir grains at some health food stores or organic supermarkets, though it’s more than likely they will have been cultured in dairy. Water kefir grains are a little harder to source, so your best bet is to have a google and see who will deliver them straight to you. For example, I purchased my initial grains here, and received them a few days later, neatly packaged with ample sugar to keep them fed and happy. This is a basic kefir recipe to get your kefir grains nice and fattened up. Once they have multiplied enough, you can do a second ferment to flavour it (below). Full of probiotic goodness for gut and immune health. If this is your first time making kefir, you may need to make a few test batches up before you get something of quality you can drink. First of all – if you’ve bought them online or from a store, and only have a small quantity, you’ll have to feed them and let them grow to the point where you have a good half a cup’s worth – this is the quantity you’ll need to make a one litre batch of kefir. Secondly, as these guys are living microorganisms, they may have been starved a little in transit, so they’ll now need a little love before they get their probiotic mojo back. Sterilise a glass jar, pour a small amount of boiling water in the bottom (an inch or so), add a few tablespoons of sugar, top with 500ml cold, filtered water, and add the kefir grains. Cover the mouth of the jar with a paper towel fastened with a rubber band, and let to culture somewhere warm (not in direct sun) for 48 hours (note – the culture time for kefir is far quicker than with kombucha). At this point, you may have noticed the grains have doubled their weight – this is good – repeat the process again, doubling the amount of sugar AND water, and hopefully you’ll notice the water eventually loses its sweet taste and becomes a bit carbonated. The kefir grains apparently do well when fed something with a high mineral content, some suggest adding a few eggshells to the mix, but I prefer to add an organic date – it seems to do the trick nicely. Tip - don’t let the kefir grains touch anything metal – they don’t like it! Use wooden utensils and plastic sieves. In this second ferment, you'll be infusing some lovely flavour into your kefir. 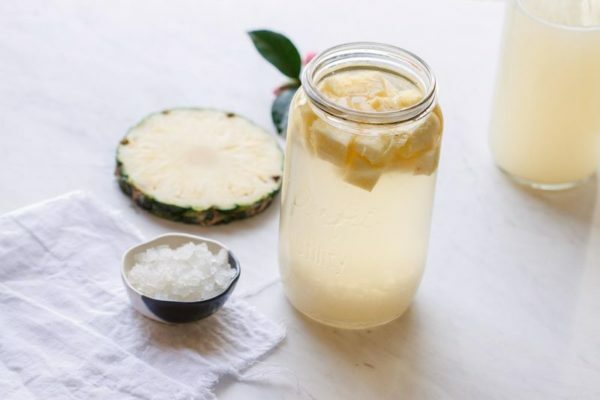 Once you have a good half a cup of grains, you can now make up a flavoured coconut water kefir. 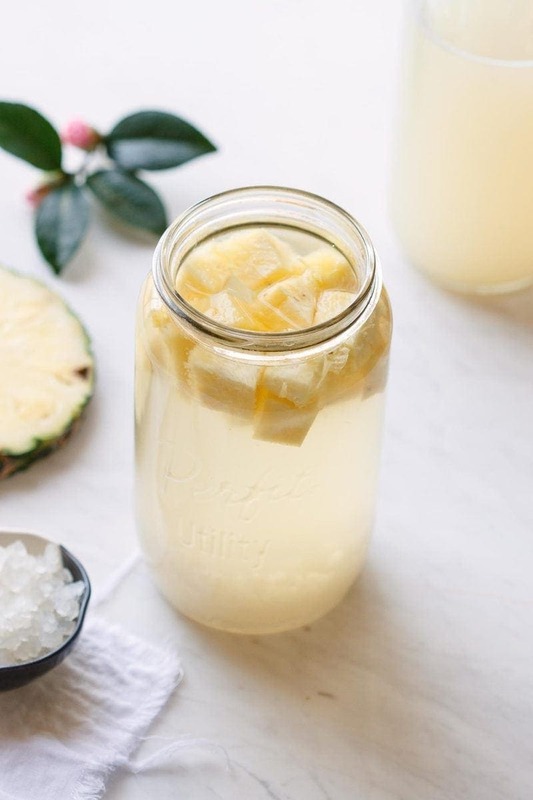 In a one litre jar, dissolve ¼ cup sugar in a few inches of boiling water, then add cold coconut water – leave some room at the top as you’ll need to add the grains and fruit next. Note – the coconut water naturally contains sugar – if you wanted to use filtered water instead, use ½ cup of added sugar. After adding the grains, pop in the chopped pineapple and a date, cover with a paper towel and leave to culture 48 hours. After 48 hours, you’ll notice the mixture is well and truly carbonated, and the sugar content will have been greatly reduced. It may look a little cloudy, and should taste slightly sweet, slightly sour. Decant the kefir into a glass bottle, taking care to use plastic sieves/funnels. Discard the fruit and date, but keep the kefir grains for your next batch. Store in the fridge for a few days and enjoy. Don’t stop at pineapple – there are so many gorgeous flavours to experiment with – try berry, ginger, orange… even vanilla bean. You can either compost, throw out or give away any excess kefir. The grains themselves can last indefinitely if you care for them – you can keep recycling and feeding them. 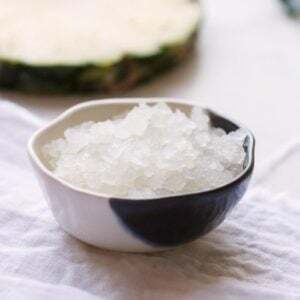 It’s a good idea to make a batch of plain sugar water + kefir in between coconut/fruit kefir, to keep the grains healthy. If you leave your kefir out to culture for too long, you will get a very sour, vinegary end product. Not so nice as a health tonic, but save it for salad dressings. Finally – many say that you shouldn’t use honey (in place of regular sugar) – I say, if you want to – go ahead! I’ve had many successful batches with honey.